Swindon have ended their interest in ex-Swansea striker Adebayo Akinfenwa, following a second medical examination. The 25-year-old had recently agreed to join the newly-promoted Robins on a one-year contract, after rejecting a one-year deal at the Liberty Stadium. But Town boss Paul Sturrock explained that Akinfenwa may not be able to play until November because of injury. "After taking the advice of specialists and doctors, this was the correct decision," he told Swindon's website. "The finances come into it because we would have taken him on a year's contract, when he may not have been fit until November or later. "I will continue the search for new players and strikers are very much at the forefront of my enquiries." 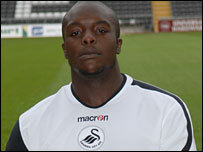 Akinfenwa scored 21 goals in 75 senior appearances since moving to Swansea from Torquay in the summer of 2005. He has also had spells with Barry Town, Boston, Leyton Orient, Rushden & Diamonds, Doncaster and Torquay. Akinfenwa recently said he felt Swansea's contract offer to him showed "a lack of appreciation" to him. His move from Torquay to Swansea two years ago was a long-running saga, which was eventually settled by a transfer tribunal. With the Gulls entitled to a fee as the player was under 24 at the time, the Swans were ordered to pay an initial fee of £35,000, with another £50,000 linked to appearances. However, Torquay will now not receive the £25,000 which they would have earned if Swansea had won promotion - and will not benefit from the 15% sell-on clause which the tribunal also insisted upon, as he is out of contract and entitled to move on a free transfer.